Run Which Way: Finally, Osprey Falls Trail! And I start debunking your excuses not to exercise. Finally, Osprey Falls Trail! And I start debunking your excuses not to exercise. The Yellowstone Half Marathon encourages runners to enjoy the park by offering discounts on next year's race for participating in specific hiking activities. There are 2 hikes worth 50% off: Mt. Washburn and Osprey Falls. We already did Mt. Washburn last year, so this year we hiked Osprey Falls trail. If you enjoy a pretty hike, you need to do this one next time you're in Yellowstone. Everything we researched said this hike was 8.8 miles out and back. Turns out it was a little further than that! 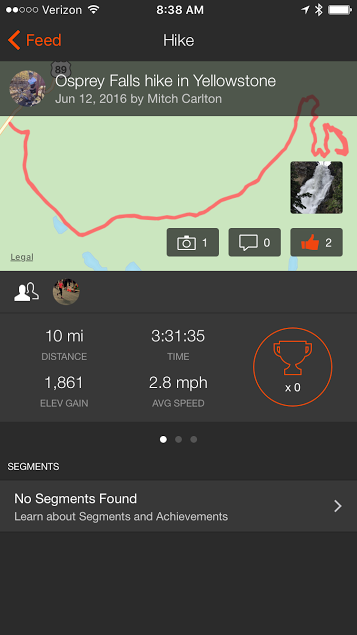 (This is Mitch's Strava entry because mine died at Mile 5). There are parts of the terrain that are loose, narrow and precarious but 100% worth the effort to get there. I took lots of pictures, but none of them do it justice. There was quite a traffic backup just before the turn off to our trailhead. This grizzly momma and her cubs was the reason. We've been to Yellowstone several times and this is the first grizzly we have seen. Surprisingly, most people kept their distance, but of course they were all parked in the middle of the road, out of their cars, taking pictures. We got this from the safety of our vehicle while passing by. But they were VERY close to our trailhead so we were extra wary on our hike. The first 3 miles are on this double track trail. It's one of maybe two places in the park you can mountain bike. We saw a couple riding this and stopped to chat with them. We joke a little because the lady refused to bring bear spray because she was afraid the can would explode in her hot car. Mind you..... we saw the bear across the street from where this trail starts. No bear spray? Bad idea! This is where the "real" trail starts. 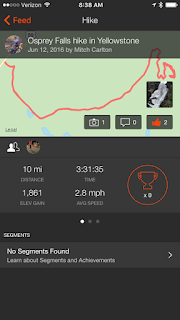 Single track with a 700 ft (corrected) descent in 2 miles. The start of the trail is deceiving! That looks so smooth and easy. The trail over there is pretty nice too. I didn't get any pics of the rough trail because I was too busy trying to keep my footing and not lose my phone. We're almost there. Just Wow! 150 ft waterfall! Stunning! You get kind of wet when you're this close. We met a nice couple on the trail and we took each others' pictures. To get the 50% credit for the hike, we had to get a picture with our medals and bibs. I'm kind of a dork and packed both medals in my backpack. They are pretty heavy and I could have got away with just one for the pictures. This did not occur to me until this moment. On the hike back (700 ft ASCENT in two miles), we met this marmont. It wasn't too concerned about out presence at all but wasn't keen on posing for the camera. The trail view on the return trip was very spectacular. Mitch was still sick when we took this hike, but overall it was a fantastic day! I would take this hike again except Yellowstone has so many places I haven't seen yet! Your excuses are lame. Just Saying! When people learn that I run, lift and bike they usually react one of two ways: 1. They start telling me about how they stay active; 2. They start telling me all the reasons they can't exercise. Sorry people... I don't buy your lame excuses. There is a way around EVERY excuse if you are willing to put forth a little effort and prioritize your own health and well-being. For this blog entry, the excuse of the day is: "I'm too old." I hear this one a LOT. But really? A body in motion stays in motion. A body at rest tends to stay at rest. Failure to be active will make you older, faster. 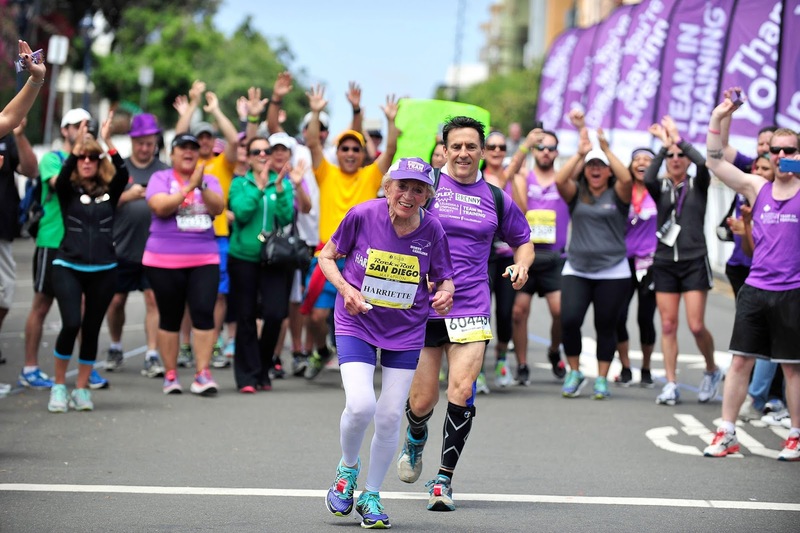 Harriette Thompson is 92 years old and finished a marathon! A marathon. Folks, that is 26.2 miles! Tell me again how you are too old to be active! Yes, these stories are on the extreme side. 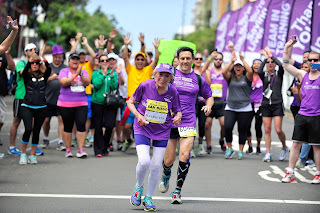 Most 79 and 92 year old people aren't running marathons and competing in body building events. But there are so many activies you CAN do. So get busy! What excuses not to exercise do you hear the most? What excuse do you use the most?